If you are wondering if this is my new way to garden, I must prove you wrong. As much as I like the idea, I have not arranged this composition. The old shoe and its inhabitant are “living” in The Amish Village in Ronks, PA. The “village” is in reality a farmhouse with out buildings for the animals, a smithy, some additional farm equipment, and a schoolhouse – all together an outdoor museum. While not specifically “Amish”, the idea of frugal living and not throwing away even used items agrees with their simple way of life. Why not reuse for a totally different purpose and in the same time create a new a beautiful object? My contributions to Cee’s Fun Foto Challenge – Old and New. I am also entering this photograph in Weekly Photo Challenge – Repurpose. 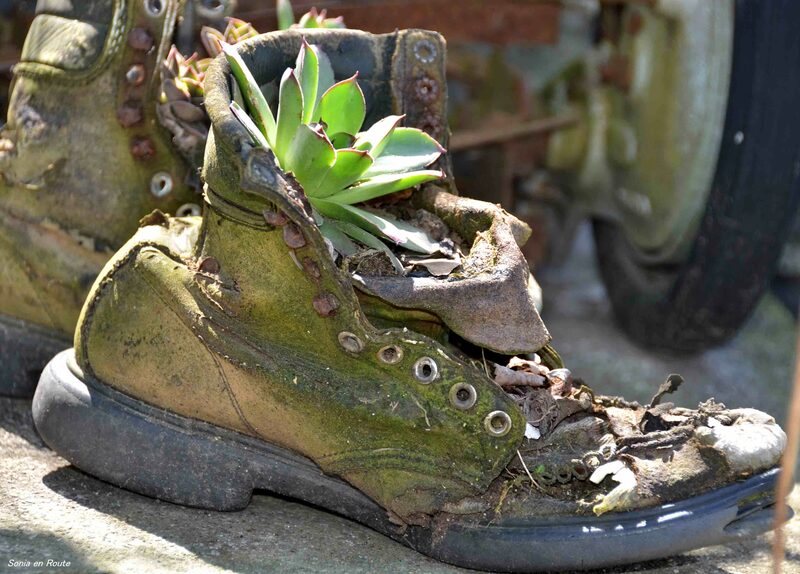 It looks as if that shoe is well on its way back to becoming earth! How very brilliant. I adore your photo. I sure hope you have a super day!